If you had to count the number of monogrammed items in your home, driveway, and closet would you lose count? What is preppier than having your monogram on things that you use and wear every day? I love monograms and can't get enough! The Official Preppy Handbook summarizes it best...When Your Own Initials Will Do. 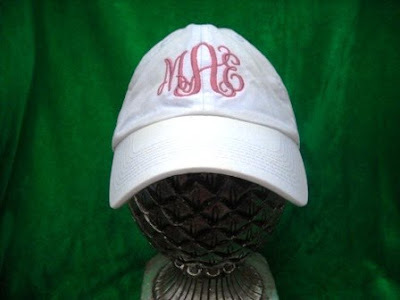 Make a day at the beach or a quick run in the park a little bit preppier with a monogrammed hat. Normally, I'm not much of a baseball hat kind of girl, but this is an adorable go-to option for early mornings. People say I look cute. At my age. In a baseball hat. In other words, you need one of these ASAP! Everyone will know which drink is yours when you have monogrammed Tervis Tumblers. The pink is fabulous and the largest size is perfect for a big Diet Coke. I've even purchased the Tervis Tumbler lids and straws that match perfectly with the pink monogram. Seriously, the Tervis Tumbler is amazing. It kept ice nearly intact from Chincoteague to the Annapolis Bay Bridge on the way home from the beach. Pretty impressive! Take your preppy show on the road with monogrammed license plates or car decals! These are so incredibly popular right now. 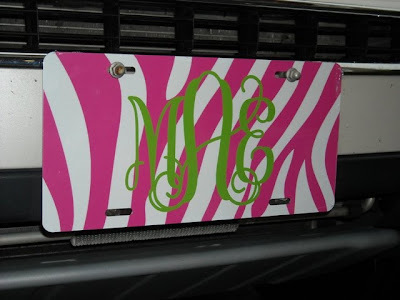 2 Preppy Girls has the cutest monogrammed things to wear, to use, and to put on your car. You're sure to find something you like and their customer service is wonderful. What is your favorite item to monogram? How many monogrammed items do you estimate that you have? I looove my tervis tumbler and car monogram! 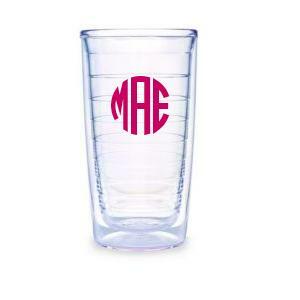 I love our PB monogrammed pint glasses! Ooooooh! I need to start increasing my monogrammed collection! I think this hat would be a perfect addition!! Have a good weekend! Love it all! I have a birthday coming up and on my wish list are monogrammed covers for my Kindle & iphone!